Wedding Ring Tattoo? So, you’re going to get married and you want your wedding to be special. Maybe you aren’t planning on turning it into a rock concert, but still, you want something to stand out and be different. If you want to stick to a more traditional venue but still want something unique to you and your fiancée, how about swapping traditional rings for tattooed wedding rings? If you like the idea of tattooed rings but still want something traditional, you can do a basic wedding band. There are still plenty of design options to choose from with these bands, but if you want to keep it simple then a classic wedding band is the way to go. Incorporating you and your partner’s initials can be done in all kinds of ways. Some couples like to have the letters stand alone, while others weave them into a meaningful design (Celtic knots with the initials in the center, for example). 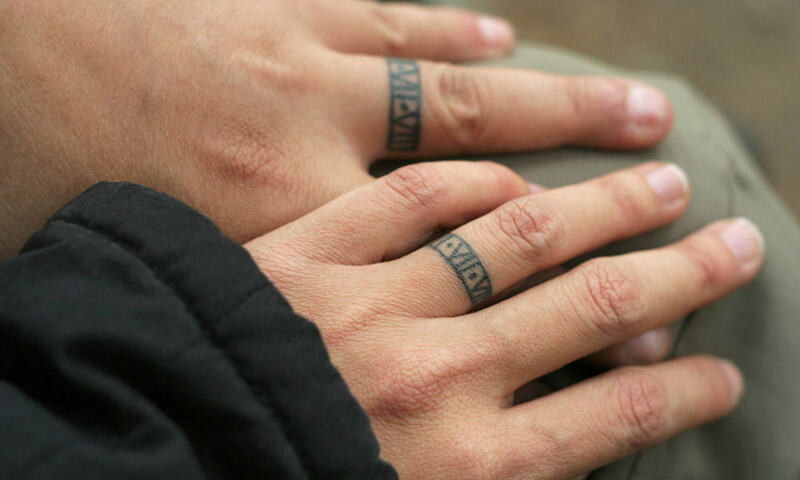 Another cool idea is to use different but related objects as ring tattoos. Some examples of this are a lock and key, a tree and a bird, or different musical notes. If there is an object that has a special meaning to you and your fiancée, you can incorporate that into your design. The possibilities for ring designs are endless, and the result will be romantic work of art that will last a lifetime. Have questions about Las Vegas tattoo artists, body piercing, or laser tattoo removal? Contact us for more information!